Received: June 6, 2016; Revised: September 2, 2016; Accepted: September 20, 2016; Published online: December 1, 2016. The purpose of this study was to investigate the impact of varying knee flexion and quadriceps activity on patellofemoral indices measured on magnetic resonance imaging (MRI). MRI of the knee was performed in 20 patients for indications other than patellar or patellofemoral pathology. Axial and sagittal sequences were performed in full extension of the knee with the quadriceps relaxed, full extension of the knee with the quadriceps contracted, 30° flexion of the knee with the quadriceps relaxed, and 30° flexion with the quadriceps contracted. Bisect offset, patella tilt angle, Insall-Salvati ratio and Caton-Deschamps index were measured. With the knee flexed to 30° and quadriceps relaxed, the mean values of patellar tilt angle, bisect offset, Insall-Salvati ratio and Caton-Deschamps index were all within normal limits. With the knee extended and quadriceps contracted, the mean patellar tilt angle (normal value, <15°) was 14.6° and the bisect offset (normal value, <65%) was 65%, while the Caton-Deschamps index was 1.34 (normal range, 0.6 to 1.3). 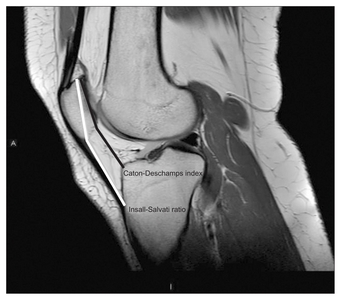 With the knee extended and quadriceps relaxed, the mean Caton-Deschamps index was 1.31. MRI scanning of the knee in extension with the quadriceps contracted leads to elevated patellofemoral indices. MRI taken with the knee in 30° of flexion allows more reliable assessment of the patellofemoral joint and minimises the confounding effect of quadriceps contraction. The patellofemoral joint is one of the most common sources of knee pain in younger people. Maltracking and instability of the patellofemoral joint are responsible for the majority of symptoms and are associated with the development and progression of osteoarthritis1). The position of the patella relative to the trochlea of the femur is not fixed and changes as the knee moves from extension to flexion. Differences in the morphology of the patellofemoral joint have been shown to be associated with altered kinematics and patellofemoral instability2–9). A variety of measurements have been described to identify abnormalities of the patellofemoral joint. On a lateral radiograph, or a sagittal magnetic resonance imaging (MRI) scan, the Insall-Salvati index10) is measured to assess patella height by comparing the length of the patellar tendon with the length of the patella. The Caton-Deschamps index11) can also be used to determine patellar height and is calculated by comparing the length of the patellar articular surface with the distance from the postero-inferior border of the patellar and the anterior edge of the tibial plateau. On the axial view, the bisect offset can be used to assess medial or lateral displacement of the patella. Patellar tilt is also assessed on the axial view and is normally 0°–5° relative to a line connecting the posterior femoral condyles. The position of the knee and its weight bearing status have been shown to influence patellofemoral kinematics and measurement of patellofemoral indices12–15). MRI is commonly used in the investigation of patellofemoral pain and instability and in many cases is the investigation of choice in preference to plain radiography. MRI provides additional information compared to radiographs, such as the condition of the articular surfaces, integrity of ligamentous stabilising structures (e.g. the medial patellofemoral ligament), and rotational alignment (tibial tuberosity trochlear groove), and facilitates better evaluation of trochlear dysplasia5,16–20). Whilst the patellofemoral indices described above were originally designed for radiographic measurements, they have been applied to MRI which has been shown to be an excellent imaging modality for evaluating the patellofemoral joint with good correlation with plain radiographs21–24). MRI is usually taken with the patient in supine position and the knee in extension1,21). It has been demonstrated that patellofemoral instability typically manifests during the terminal 30° of knee extension with contraction of the quadriceps femoris muscle14). Undergoing an MRI scan can be an intimidating experience for patients, particularly those prone to claustrophobia25,26). Such patients are likely to be anxious and tense during the scan and may inadvertently contract their quadriceps. This quadriceps contraction may alter the relationship of the patella to the femur, overestimating the degree of instability that may be present. The objective of our study was to determine the impact of knee position and quadriceps contraction on patellofemoral indices measured on MRI. Twenty patients undergoing MRI scan of the knee were identified from a pool of referrals to the orthopaedic department at our institution. Patients were selected based on the absence of patellar or patellofemoral symptoms documented in the clinical notes or on the MRI request. Inclusion criteria were 25–40 years of age, a body mass index less than 30, a clinical diagnosis of non-patellar or patellofemoral pathology. Exclusion criteria were known or suspected patellar or patellofemoral conditions, connective tissue disorders that could cause hyperlaxity, and previous surgery or injury to the knee. All measurements were performed by a consultant radiologist and an orthopaedic surgeon together synchronously. Axial and sagittal MRI sequences were performed with the knee fully extended and quadriceps contracted; knee fully extended and quadriceps relaxed; knee flexed 30° with quadriceps contracted; and knee flexed 30° with quadriceps relaxed. A triangular wedge was placed under the patient’s knee to reproducibly create 30° of flexion. When quadriceps contraction was required, subjects were given a rest period between MRI sequences to prevent muscle fatigue. Bisect offset27) and patellar tilt angle28) were measured on axial MRI images using the slice showing the widest view of the patella. The Insall-Salvati index and Caton-Deschamps index were measured on the sagittal view using the slice showing the widest view of the patella. Four measurements were used on both axial and sagittal MRI images to determine pathology. Bisect offset (Fig. 1) was determined by drawing a line connecting the posterior femoral condyles and a perpendicular line was then drawn through the deepest point of the trochlea groove to where it intersects the patellar width line. In cases where the trochlea was flattened, the perpendicular line was drawn at the midpoint between the posterior femoral condyles. The bisect offset is defined as the proportion of the patella lying lateral to the midline as a percentage of the whole patellar width. Subjects were considered having excessive bisect offset if they had values over 65%. Patellar tilt was defined as the angle between a line connecting the posterior femoral condyles and the maximum patellar width (Fig. 2). The Insall-Salvati ratio was determined by comparing the length of the patellar tendon with the length of the patella. The Caton-Deschamps index was defined as the ratio of the distance between the lower edge of the patellar joint surface and the upper edge of the tibial plateau to the length of the patellar articular surface (Fig. 3). The Student t-test (unpaired) was used to compare the difference between these values in the various states of knee flexion and quadriceps contraction. All 20 patients were assessed with the knee in extension and flexion, with and without quadriceps contraction. There were 12 females and 9 males; their average age was 31 years. The mean values of the patellar tilt, bisect offset, Insall-Salvati ratio and Caton-Deschamps index of the patients are detailed in Table 1. The mean patella tilt averaged 9° with the knee flexed and quadriceps in any state. Patella tilt increased but remained within normal limits with the knee extended and quadriceps relaxed. However, when the quadriceps was contracted with the knee in extension, the mean patella tilt was 14.6°, the upper limit of the normal range. The mean difference in patella tilt from the flexed, relaxed positon to the extended, contracted position was 5.6° (range, –9.8° to +25.9°), but this did not reach statistical significance (p=0.06). The mean bisect offset angle in the flexed position increased from a normal range of 56% and 57% when the quadriceps were relaxed or contracted, respectively, to an abnormal value of 65% with the knee extended and quadriceps contracted (p=0.012). There were four patients who demonstrated normal patella tilt and bisect offset with the knee flexed and quadriceps relaxed, but abnormally high tilt and bisect offset were observed with the knee extended and quadriceps contracted. The mean values of the Caton-Deschamps index were within the normal range with knee flexed but were abnormally elevated with the knee extended, both with the quadriceps relaxed and contracted. The difference between the flexed relaxed position and extended contracted position was 0.05 (range, –0.15 to +0.31), which did not reach statistical significance (p=0.34). The mean values of the Insall-Salvati ratio were normal in all combinations of knee position and quadriceps contraction. The change in the Insall-Salvati ratio from the flexed, relaxed state to the extended, contracted state was –0.07 (range, –0.17 to +0.11), which was not statistically significant (p=0.97). MRI evaluation of the knee forms an integral part of the investigation of young patients with knee pain. The patella begins to engage the trochlea during knee flexion, and patellofemoral instability typically manifests during the terminal 30° of knee extension. In the clinical setting of patellofemoral disorders, MRI can provide useful information about the bony morphology of the femur and patella as well as the condition of the articular cartilage. Numerous patellofemoral measurements or indices have been described to quantify abnormalities of the patellofemoral joint. Many of these measurements were originally described on plain radiographs and their use has been extended to MRI. They can be of some value when deciding on the most appropriate management for patients with patellofemoral symptoms. Significant differences in these measurements exist between patients with patellofemoral instability and asymptomatic patients3,6). Quadriceps contraction and weight bearing have been shown to alter patellar height and patellofemoral kinematics12–15,29,30). For the majority of patients, MRI of the knee is performed with the knee extended. Patients undergoing MRI scanning of the knee may be anxious and as a result involuntarily contract their quadriceps. This may lead to inaccurate measurement of patellofemoral indices and overdiagnosis of instability. This has the potential to lead to inappropriate management decisions or unnecessary surgery. In our study, we aimed to assess the influence of knee position and quadriceps activity on frequently measured patellofemoral indices. In our cohort of patients, none of whom had patellofemoral symptoms, an increase in the measured patellofemoral indices was observed with the knee extended and quadriceps contracted. The mean values of these indices increased above the normally accepted range in some cases with the knee in this position. In the case of the bisect offset, the increase reached statistical significance. With the knee flexed, all mean values were within normal limits regardless of quadriceps activity. This suggests that the flexed position protects against erroneous or exaggerated patellofemoral measurements caused by inadvertent quadriceps contraction as well as trochlea engagement. Many patients assessed for patellofemoral pathology undergo MRI scans. Thus, it is important that potential confounders (e.g. quadriceps contraction and knee extension) are minimised in order to achieve more reliable measurements upon which surgical decision-making is based. We, therefore, recommend, when investigating patients with suspected patellofemoral pathology, MRI of the knee should be performed in 30° of flexion to obtain a more accurate view of the patellofemoral joint and avoid the confounding effects of quadriceps contraction. Patellofemoral indices measured on MRI are affected by the position of the knee and quadriceps muscle activity. With the knee in extension and the quadriceps contracted, as may occur in an anxious patient, there was a tendency towards abnormal patellofemoral measurements in our cohort of asymptomatic patients. Performing MRI of the knee in 30° of flexion helps to reduce the confounding effect of quadriceps contraction and may result in more reliable radiological assessment of the patellofemoral joint. Fig. 2. Patellar tilt angle. Fig. 3. The Insall-Salvati ratio and Caton-Deschamps index. Biyani, R, Elias, JJ, Saranathan, A, Feng, H, Guseila, LM, Morscher, MA, and Jones, KC (2014). Anatomical factors influencing patellar tracking in the unstable patellofemoral joint. Knee Surg Sports Traumatol Arthrosc. 22, 2334-41. Charles, MD, Haloman, S, Chen, L, Ward, SR, Fithian, D, and Afra, R (2013). Magnetic resonance imaging-based topographical differences between control and recurrent patellofemoral instability patients. Am J Sports Med. 41, 374-84. Colvin, AC, and West, RV (2008). Patellar instability. J Bone Joint Surg Am. 90, 2751-62. Dejour, D, Ferrua, P, Ntagiopoulos, PG, Radier, C, Hulet, C, Remy, F, Chouteau, J, Chotel, F, Boisrenoult, P, Sebilo, A, Guilbert, S, Bertin, D, Ehkirch, FP, Chassaing, V, and French Arthroscopy Society (SFA) (2013). The introduction of a new MRI index to evaluate sagittal patellofemoral engagement. Orthop Traumatol Surg Res. 99, S391-8. MacIntyre, NJ, Hill, NA, Fellows, RA, Ellis, RE, and Wilson, DR (2006). Patellofemoral joint kinematics in individuals with and without patellofemoral pain syndrome. J Bone Joint Surg Am. 88, 2596-605. Powers, CM (2000). Patellar kinematics, part II: the influence of the depth of the trochlear groove in subjects with and without patellofemoral pain. Phys Ther. 80, 965-78. Regalado, G, Lintula, H, Eskelinen, M, Kokki, H, Kroger, H, Svedstrom, E, Vahlberg, T, and Vaatainen, U (2014). Dynamic KINE-MRI in patellofemoral instability in adolescents. Knee Surg Sports Traumatol Arthrosc. 22, 2795-802. Stefanik, JJ, Zumwalt, AC, Segal, NA, Lynch, JA, and Powers, CM (2013). Association between measures of patella height, morphologic features of the trochlea, and patellofemoral joint alignment: the MOST study. Clin Orthop Relat Res. 471, 2641-8. Insall, J, and Salvati, E (1971). Patella position in the normal knee joint. Radiology. 101, 101-4. Caton, J (1989). Method of measuring the height of the patella. Acta Orthop Belg. 55, 385-6. Draper, CE, Besier, TF, Fredericson, M, Santos, JM, Beaupre, GS, Delp, SL, and Gold, GE (2011). Differences in patellofemoral kinematics between weight-bearing and non-weight-bearing conditions in patients with patellofemoral pain. J Orthop Res. 29, 312-7. Kim, TH, Sobti, A, Lee, SH, Lee, JS, and Oh, KJ (2014). The effects of weight-bearing conditions on patellofemoral indices in individuals without and with patellofemoral pain syndrome. Skeletal Radiol. 43, 157-64. Patel, VV, Hall, K, Ries, M, Lindsey, C, Ozhinsky, E, Lu, Y, and Majumdar, S (2003). Magnetic resonance imaging of patellofemoral kinematics with weight-bearing. J Bone Joint Surg Am. 85, 2419-24. Powers, CM, Ward, SR, Fredericson, M, Guillet, M, and Shellock, FG (2003). Patellofemoral kinematics during weight-bearing and non-weight-bearing knee extension in persons with lateral subluxation of the patella: a preliminary study. J Orthop Sports Phys Ther. 33, 677-85. Cusmano, F, Adravanti, P, Pedrazzini, M, Ampollini, A, and Pavone, P (2001). Radiologic assessment of femoro-patellar instability: personal experience and review of the literature. Radiol Med. 101, 66-74. Elias, DA, and White, LM (2004). Imaging of patellofemoral disorders. Clin Radiol. 59, 543-57. Guilbert, S, Chassaing, V, Radier, C, Hulet, C, Remy, F, Chouteau, J, Chotel, F, Boisrenoult, P, Sebilo, A, Ferrua, P, Ehkirch, FP, Bertin, D, Dejour, D, and French Arthroscopy Society (SFA) (2013). 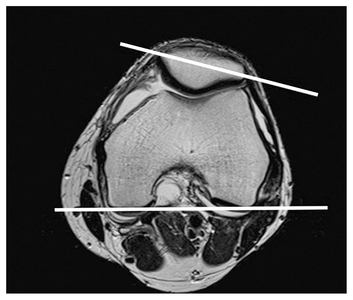 Axial MRI index of patellar engagement: a new method to assess patellar instability. Orthop Traumatol Surg Res. 99, S399-405. Hayes, CW (1994). 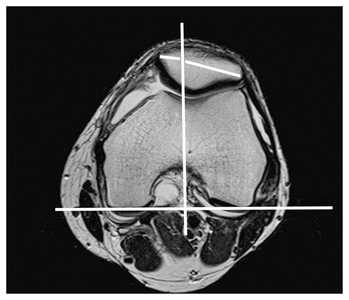 MRI of the patellofemoral joint. Semin Ultrasound CT MR. 15, 383-95. Thomas, S, Rupiper, D, and Stacy, GS (2014). Imaging of the patellofemoral joint. Clin Sports Med. 33, 413-36. Chhabra, A, Subhawong, TK, and Carrino, JA (2011). A systematised MRI approach to evaluating the patellofemoral joint. Skeletal Radiol. 40, 375-87. Lee, PP, Chalian, M, Carrino, JA, Eng, J, and Chhabra, A (2012). Multimodality correlations of patellar height measurement on X-ray, CT, and MRI. Skeletal Radiol. 41, 1309-14. McNally, EG, Ostlere, SJ, Pal, C, Phillips, A, Reid, H, and Dodd, C (2000). Assessment of patellar maltracking using combined static and dynamic MRI. Eur Radiol. 10, 1051-5. Pal, S, Besier, TF, Beaupre, GS, Fredericson, M, Delp, SL, and Gold, GE (2013). Patellar maltracking is prevalent among patellofemoral pain subjects with patella alta: an upright, weightbearing MRI study. J Orthop Res. 31, 448-57. Murphy, KJ, and Brunberg, JA (1997). Adult claustrophobia, anxiety and sedation in MRI. Magn Reson Imaging. 15, 51-4. Quirk, ME, Letendre, AJ, Ciottone, RA, and Lingley, JF (1989). Anxiety in patients undergoing MR imaging. Radiology. 170, 463-6. Brossmann, J, Muhle, C, Schroder, C, Melchert, UH, Bull, CC, Spielmann, RP, and Heller, M (1993). Patellar tracking patterns during active and passive knee extension: evaluation with motion-triggered cine MR imaging. Radiology. 187, 205-12. Sasaki, T, and Yagi, T (1986). Subluxation of the patella. Investigation by computerized tomography. Int Orthop. 10, 115-20. Biedert, RM, and Gruhl, C (1997). Axial computed tomography of the patellofemoral joint with and without quadriceps contraction. Arch Orthop Trauma Surg. 116, 77-82. Yiannakopoulos, CK, Mataragas, E, and Antonogiannakis, E (2008). The effect of quadriceps contraction during weight-bearing on four patellar height indices. J Bone Joint Surg Br. 90, 870-3.